Here’s the full conversation with Melvin Jose, the Chairman of Vibez, the band of MIT. I’m Melvin from Chengalpet. I’m a day scholar. My mom is a teacher and I did all my schooling in the school where she works. When I was in 12th grade, I secured the first rank in my school and so, I was able to get into MIT. I chose instrumentation here. I play the keyboard. I joined the band in my second year. I found about it through seniors and I was selected after auditions. At the end of my third year, I was made chairman as I mingled well and had a good rapport with everyone. I wanted Joseph, our drummer, to be the head but he recommended me and I accepted it. Every Sunday, I used to watch a student of my mother’s play at the Church. And I got interested in music. It turned out that my late father was also a keyboard player. So maybe it was in my genes. I started learning when I was in my sixth grade. I initially started with carnatic music but after a year, I switched to western because I was really interested in it and continued learning till tenth grade. After that, during my higher secondary, I mostly played at home as board exams came up. Vibez is our college’s band. Other colleges have few members, say six, to play all the instruments in the band. But our band isn’t like that. We have about 20 members. There’s a drummer, two guitarists, a bass guitarist and we also have many vocalists. We have an equal number of guys and girls here. We believe in giving an opportunity to any talents who are interested. We hold yearly auditions to recruit. When I was in my first year, the band won in Chemfest, the CMC College’s cultural fest. After that, outside participation went down. 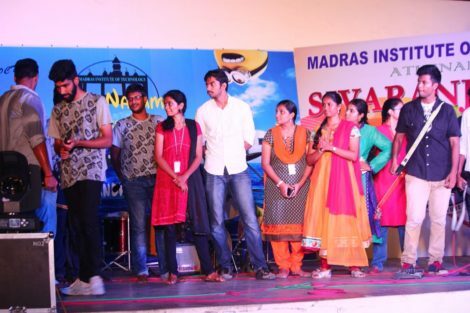 Last year, we started participating again and won in MNM Jain College’s cultural fest. We perform mostly fast songs. That’s the plan for the year ‘cause that’s what the college audience enjoys. I make sure the singers choose songs which involve everyone and all the instruments. That’s the point of the band, to be fair to everyone because this is not karaoke where you can sing anything you want but a group of people so we choose songs which suits everyone. What were some of the best performances of Vibez? On campus, I would say our performance at Sivaranjani last year was great. 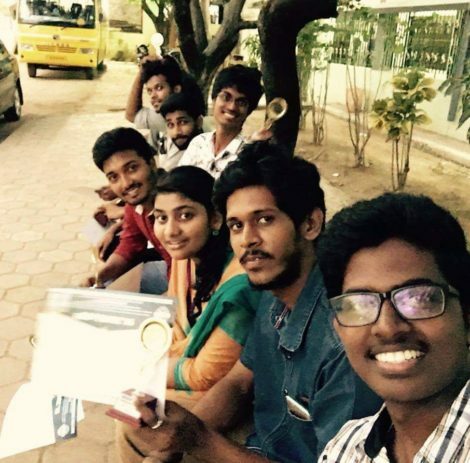 And outside of campus, we performed well at MNM Jain last year. We had two seniors with us back then, one who plays the flute and the keyboard and another who is a singer. Who would you say is the star of Vibez? That would be David, our bass guitarist. He’s from the aeronautical department; he’s in his third year. He learnt to play the guitar all by himself. Immensely talented, he can pick up anything in just two minutes. He also plays the keyboard and acoustic guitar. So I would say he’s our star performer. What’s going on with the band right now? Since the start of the semester, we were waiting for placements to get over. 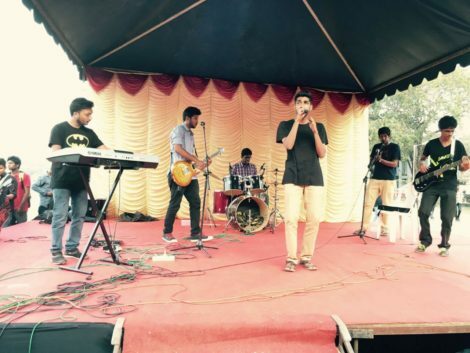 After the bulk recruitment ended, we performed at Sivaranjani. It went well and we got good feedback, particularly about the Rahman medley. We are planning to attend other college competitions. Right now, there aren’t many fests going on, except at medical colleges. The arts and engineering colleges have their events next semester. So we plan to attend all those. Here, at Vibez, we don’t do different songs for each event but we try to nail one performance and use that in all the fests we contest in. Tell us an unforgettable experience which happened. There are plenty of them, actually. Well, our bass guitarist, David’s laugh is peculiar. So we make him laugh and have fun watching it. It’s really fun to have him around. So his laugh itself is an unforgettable memory. There are plenty of talented people here who don’t come forth. The auditions for the current year are over but if anyone’s really interested, we can conduct auditions and select them if they have the talent. Also, any announcements will be put up on the notice boards. Generally, we have it only after 4:30 so sometimes they don’t wait. I hope people wait because there are still many unrecognized talents here and we hope to bring them all to the stage. The interview was conducted by Harini Mahadevan and Dinesh Kumar LN for the MIT Quill. This entry was posted in Campus, Chill With Quill, General, Interviews. Bookmark the permalink.